Nautilus Image Converter is a Nautilus extension to mass resize and rotate images. It adds a "Resize Images..." menu item to the context menu of all images. This opens a dialog where you set the desired image size and file name. 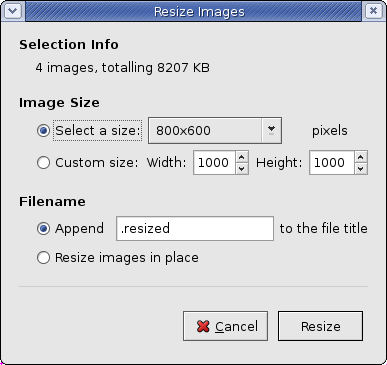 A click on "Resize" resizes the image(s) using ImageMagick's convert tool. A "Rotate Images..." menu item is also available. to kill all the instances of nautilus (make sure you do not look anything when you run this command). I wonder why they don’t include these parameters for installed versions of Ubuntu? No one resizes their pics in this day and age?